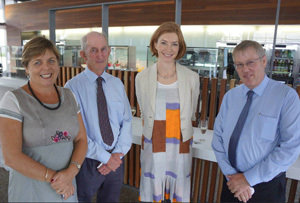 The Fund has a range of ways it encourages the interest of young Australian agricultural researchers in international agricultural research and a recent forum provided an opportunity to explain them. 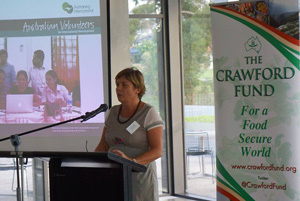 Partnering with Austraining International and ACIAR, the Fund’s Director of Public Affairs, Cathy Reade, addressed a forum in Canberra in March to further engage with young people. Cathy explained that our Conference Scholar program has supported young Australians to attend our annual conferences for the past 4-5 years and this will be repeated in 2014. Some of this group are active on the Young Crawford Group Facebook and others have recently formed the new RAID group – Researchers in Agriculture for International Development. Also, we have been partnering with international centres to develop 30 volunteer placements over the last 12 years and our Brisbane and Sydney ‘Doing Well by Doing Good’ events provide opportunities to focus on engaging young researchers to talk about their work. Most recently, the Fund has had the good news that our current volunteer placements in Kenya and Laos have been filled – more news to come!